Small Biface With Carved Human, Chimu Culture. This small bifacially flaked and carved human effigy was collected in northwestern Peru. It's believed to be a Chimu culture artifact that dates to sometime between 1000 and 1470 AD. The carving shows a human with his hands folded together over his stomach. The same figure is deeply carved onto the surface of both sides. The overall shape and size conforms to an average size projectile point but it must have been an item of importance. The carved figure probably represents some type of mythological being. It may have been hafted onto a shaft or it might have been worn as some type of jewelry. There are no sharp edges along the carved lines. The stone is semi-translucent in some areas and opaque in others. It appears to be good quality chert. It has been in contact with copper at one time. On one side of the head there are large spots of patina that are dark green. 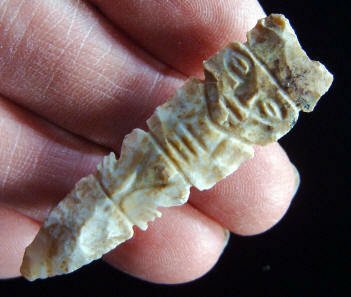 This engraved biface measures 2 1/8 inches (5.3 cm) long. 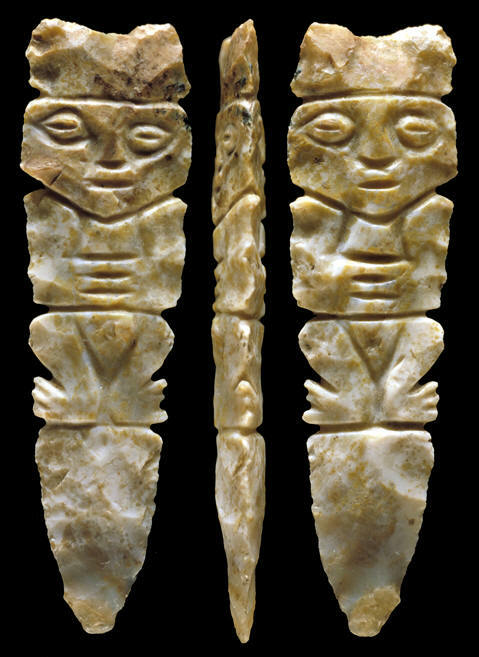 This picture shows three views of this carved human figure on a small bifacially flaked point.